Sassafrass Ridge is a unique development for a number of reasons. It offers arguably the best long range views in the Cashiers/Highlands area yet is only 15 minutes drive from the ridge top to the crossroads in Cashiers. Water is provided by a regional water utility company removing the biggest concern for most home owners in the mountain, water availability. This lot was appropriately named Azalea for the abundant flame azaleas present on the lot. This lot also has an amazing grouping of all three rhododendron specimens, laurel, blueberry bushes and the rare pink shell azalea. The home was named “Camp Chimney” as it is sited on a lot at the base of Chimney Top. 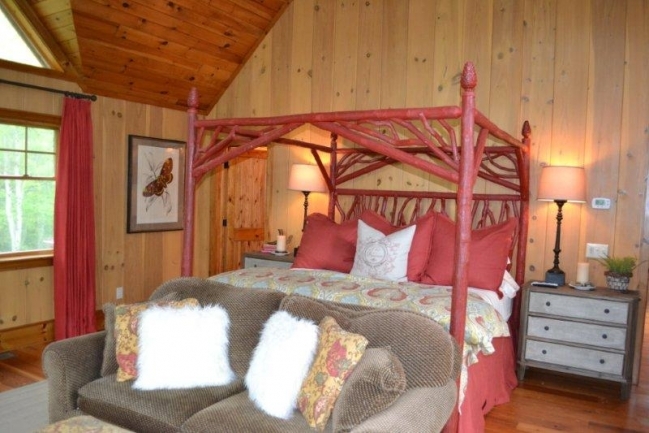 Surrounded by national forest and a land conservancy on almost 10 acres, it is serene and private. Camp Chimney is unique and a wood lover’s delight. With natural lighting from the many windows throughout the home it is light and bright. The ceiling is a work of art due to the many angle and log beams incorporated into the design. The main floor includes a great room with cathedral ceilings and a river rock fireplace. Lingering over that glass of wine in the dining area is easy with such magnificent views. The kitchen is adorned with cherry cabinets, and the master suite is warmed with an additional fireplace. There are three custom designed sinks on the main level and two stain glass panels created by local artisans. Many of the woods used in the home were cut from the property. Cherry, sourwood, oak, walnut, mountain laurel and maple are found throughout the home. Mother Nature can be enjoyed best by hiking the number of trails on the property or just enjoying her cool summers from one of several decks. The outdoors fireplace is always a favorite gathering spot and is found in the screened covered deck off the great room. The wide spiral staircase with its sourwood handrail takes you to the terrace level where another great room is graced by a baby grand player piano. What fun it is to gather round for a sing along. For those wishing a snack the kitchenette is close by. Two more large suites and three full baths provide privacy for large families. Walk out into the garden to enjoy your morning cup. The grounds have self-watering landscaping so your time on the mountain is yours to enjoy. Top of the line kitchen appliances, granite, serving island with stunning cherry top. A favorite spot to gather round with family and friends. Audio, Speakers and Volume Control in all main rooms and outdoor deck. Each is independent of other rooms. Artistically designed accents throughout the exterior! Area served by 4 airports: Atlanta, Greenville, Asheville and Charlotte..
Lutron “intelligent” lighting system is fabulous through the home. Lights Welcomes you home as you enter the drive.